For many seniors, doctor appointments can be a confusing blur. Figuring out how to get the best possible health care can be overwhelming. 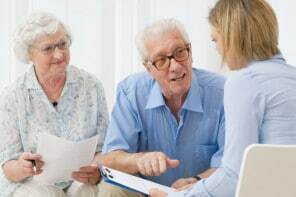 Having you as their health advocate will improve your older adult’s overall health – especially if they need help talking about sensitive subjects, keeping track of details, or making sure their care is coordinated among multiple doctors. We explain how to get started helping your older adult with their medical care and share 7 ways to be a great health advocate. Being a health advocate means that you’re looking out for their best interests. Don’t be nervous about not knowing everything about your senior’s medical conditions, you’ll learn as you go. Start by asking your older adult if they’ll allow you to help. Let them know that you want to make visits easier for them, not completely take over. They’ll still be the lead person when talking with the doctor, but you’ll be there to cover additional questions and take notes. A few weeks before your older adult’s doctor appointment, start talking with them about how they’ve been feeling and if anything is bothering them. You’ll get more information when they’re relaxed and have time to think and talk things out. Write down questions, concerns, problems, or new symptoms so you remember important issues and details and will remember to bring them up during the appointment. It’s nearly impossible to keep everything the doctor says in your head or remember months later. Taking notes at each appointment helps you and your senior understand why certain decisions were made or what the doctor said. A big part of a doctor’s job is to make sure you both understand, so don’t be embarrassed to keep asking until you really get it. If you don’t ask, they’ll assume you already know. Most seniors live with chronic health conditions. Clearly understanding the condition, treatment options, and side effects keeps them in better overall health. What is or will be the added benefit of this? Will it affect the ability to function independently? What are the possibilities or consequences if we choose not to do this? Ask the doctor to do a full medication review at least once a year. This checks to see if all the medications are working well together, being taken at the right times and in the right combinations, and if they’re all still needed. The fastest and easiest way to prepare is to bring the actual bottles of everything your senior takes – prescriptions, non-prescription drugs, vitamins, and supplements. That lets the doctor easily see medication names, exact dosages, and prescribing doctors. You might be surprised to hear that doctors can actually help with medical costs. For example, they might discount their fee, give free samples of expensive prescription medications, find a less expensive (but equally effective) treatment option, or tell you about financial assistance programs. But they won’t know to offer this help if you or your senior don’t ask or express concerns about treatment costs. Most older adults see multiple doctors or specialists to manage all their health conditions. The problem is that these doctors don’t communicate with each other. That’s where you come in. As the health advocate, you keep track of what each doctor says, does, and prescribes. You can share that information with each doctor to make sure they have the whole picture and that treatments don’t conflict with each other or cause drug interactions.